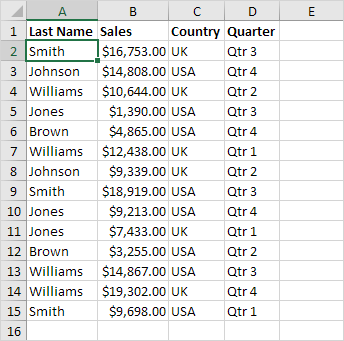 To sort on one column, execute the following steps. 1. Click any cell in the column you want to sort. 2. To sort in ascending order, on the Data tab, in the Sort & Filter group, click AZ. Note: to sort in descending order, click ZA. To sort on multiple columns, execute the following steps. 1. On the Data tab, in the Sort & Filter group, click Sort. 2. 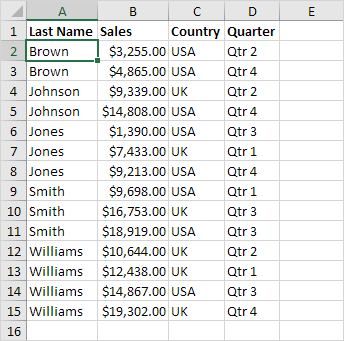 Select Last Name from the 'Sort by' drop-down list. 3. Click on Add Level. 4. Select Sales from the 'Then by' drop-down list. Result. Records are sorted by Last Name first and Sales second.